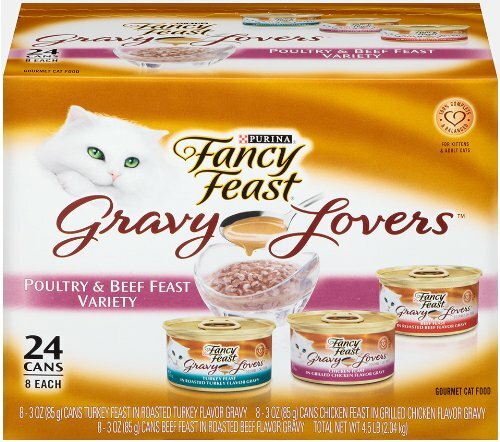 Purina Fancy Feast Gravy Lovers Poultry & Beef Feast Variety Pack contains 8 cans each of: Beef Feast in Roasted Beef Flavor Gravy, Chicken Feast in Grilled Chicken Flavor Gravy, and Turkey Feast in Roasted Turkey Flavor Gravy. Cats absolutely love the taste of the delicious recipes cooked to perfection and swimming in gravy. It offers pet parents the opportunity to give their cat a complete and balanced nutrition meal enriched with vitamins and minerals.